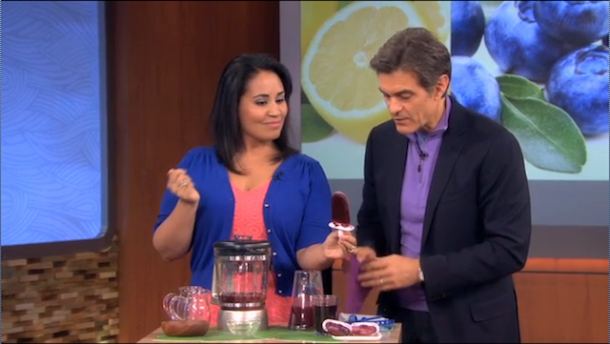 Last week, I was called in for a taping of The Dr. Oz show where I was asked to share a unique beet recipe. As you might know, I love cooking with beets in somewhat unusual ways--featuring them in beet chocolate cake, beet and goat cheese gnocchi, and even beet chocolate chip ice cream! The episode, which aired yesterday (and will re-air next Tuesday!) was about how a recent study discovered that drinking beet juice on a daily basis can help lower blood pressure by up to 10 points. The only problem? Plain beet juice--for the most part--tastes like sugary dirt, so it's unlikely that many folks will want to make a habit of it. 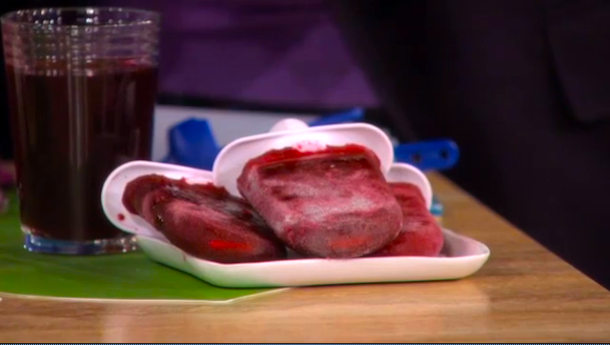 To fix this problem, two other beet-loving women and I, were challenged by the Dr. Oz show producers to come up with recipes that help make the juice a bit more palatable...and possibly even delicious! 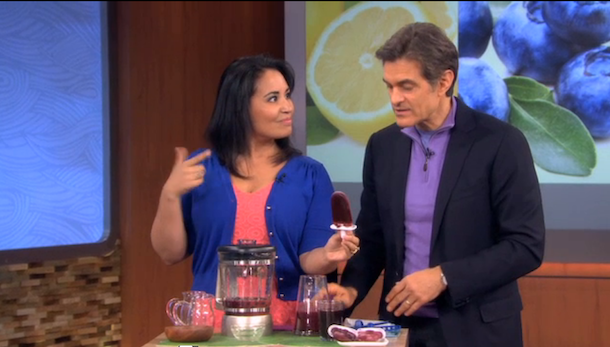 One of the women shared her beet and pineapple juice recipe, another made a beet smoothie, and I taught Dr. Oz how to make delicious beet, blueberry, and blood orange juice popsicles. 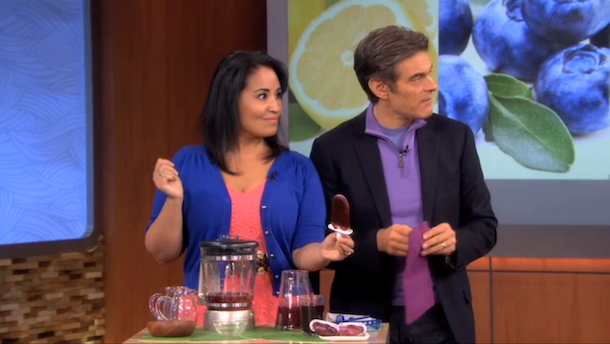 I demonstrated how to make the popsicles in a quick 1 minute segment on camera, and then Dr. Oz called an audience member up to taste and deliver a verdict. It was a hit! 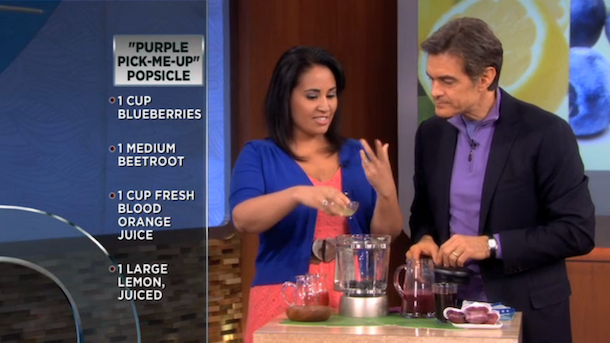 Dr. Oz actually loved my recipe so much that after we broke for commercial, he continued to eat the entire thing (so much so that make-up had to come and clean him up since he stained his mouth and lips red!). The popsicle recipe is super easy, and the tartness of the blood orange juice, blueberries and fresh lemon help cut the earthiness of the beet, while also packing in lots more antioxidants. It's a great healthy recipe for summer, and perfect for kids! 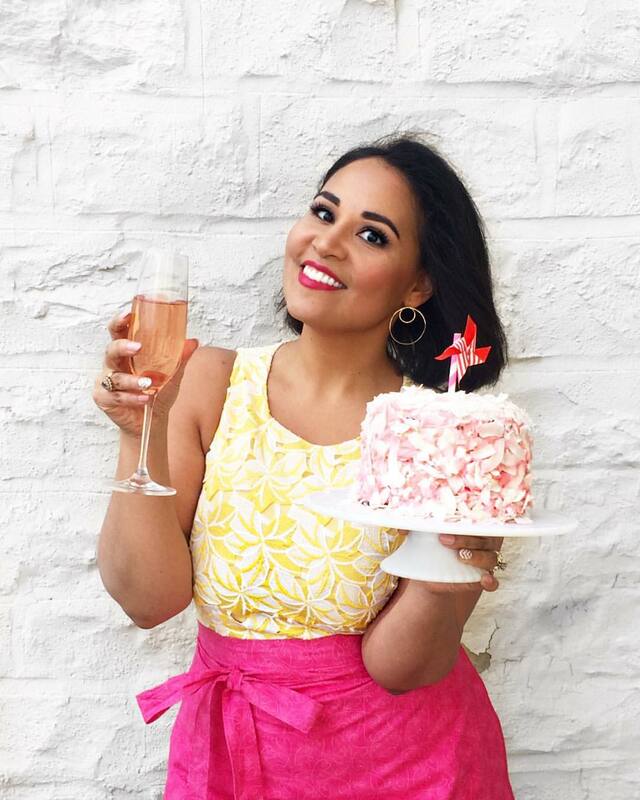 And below is the recipe so you can recreate these pops yourself! Yield depends on the size of your pop mold--multiply the recipe for more popsicles! 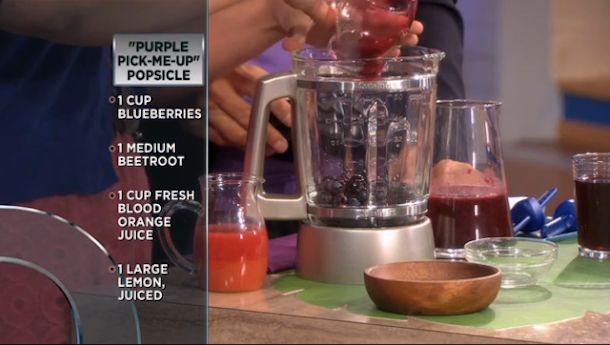 Combine the beet juice, blueberries, blood orange juice, and lemon juice in a blender and puree until smooth. Pour into popsicle molds and freeze at least 4 hours or until set. Unmold and enjoy within 3 days. Note: If you prefer, you can also juice the blueberries so you don't have the little bits of skin, although I like the texture they add!